There is color in light. Some is good and some is not so good. How does LED compare? Have you ever seen a colored light bulb? Have you seen the effect that bulb has on the items it’s illuminating? Halloween is coming up. If you haven’t seen it, try a black or orange light bulb and study how it affects the colors of what it’s illuminating. Inherently, based on the type of light bulb, the light generated from that bulb has a color. In the world of lighting, that color is measured on the Color Rendering Index (CRI). The peak of the CRI is 100. To give you an example, noon day sun would best fit this description. Remember, it’s not the color of the sun. It is how well the sun’s light reflects the truest color of an object. According to this index, poor color (where colors do not show) is 79 or lower. Good color is achieved from 80 – 94 and great color at 95 plus. The following are common bulbs, their CRI, and their common uses, and average bulb life. Quartz Halogen – CRI: 100! Although the CRI of metal halide is significantly lower, it still has a phenomenal bulb life of 12,000 – 20,000 hours. 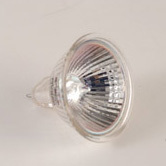 Metal halide bulbs are used for both residential and commercial lighting applications. So here is where the green bulb comes into play. LED bulb Life is 25,000 – 50,000 hours. The bulb life is what makes it so green. Unfortunately with a lower CRI, the lighting effect does not reflect the truest color of the object it’s illuminating. I am in full agreement that energy savings is a good thing. However, considering color, I’m not ready to anoint LED king just yet. To understand the importance of color, we first need to understand how it is gauged. The CRI or Color Rendering Index measures how well a light source emits a broad, complete spectrum of visible color. In laymen terms, how light reflects off of a source. This entry was posted in Color Rendering Index and tagged automotive, bulb life, ceramic metal halide, color, commercial, CRI, go green, high pressure sodium, LED, lighting, metal halide, quartz halogen, residential by outdoorlightingnashville. Bookmark the permalink.